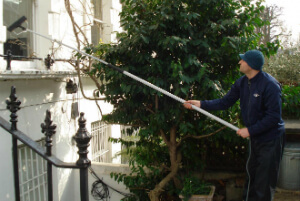 Kingston upon Thames KT Residential & Industrial Window Cleaners | Quality Property Care Ltd.
Quality Property Care Ltd. offers domestic windows cleaning and commercial windows cleaning to all businesses and residents in Kingston upon Thames KT and the area. The window cleaning is performed by very well trained, vetted and skilled windows cleaners, who use the telescopic water fed poles to first wash off and if needed scrub off the dirt, and then to rinse everything off. If the frames and sills are from PVC, they can be cleansed too. The purified water contains no minerals or residue, so it is kept to dry naturally and leaves no stains or streaks. Plus, it helps protect the windows from dust buildup for longer. No ladders are used and no manual scrubbing, so there is no peeking inside your home or office by the cleaners. Conservatories and conservatory roofs also. The business Quality Property Care Ltd. can provide you with you higher floor window cleaning via the specialised rope access windows cleaning groups. They will clean all windows above the 4th floor.Additionally, the provider offers indoor window washing as a separate service, or as part of regular or commercial cleaning and one off residential cleaning.The cleaners will clean the windows in all kind of commercial properties and all kind of domestic properties with the help of squeegees, microfiber cloths, professional and safe glass cleaning solution, and with the help of ladders whenever necessary. You can combine the outdoor and indoor window cleaning with the expert curtain cleaning offered by the organization as well, for an even more lovely result. Along with your expert windows cleaning, you can also book one or more other maintenance services and outdoor cleaning. By booking more than one service provided by the company you will save a lot of time and money , and will receive a total cleaning service at the same time. You can get professional driveway jet washing, gutter cleaning, patio, outside and inside conservatory window cleaning, gardening and others. Certainly, for a full cleaning, you can order curtain cleaning and indoor windowns cleaning too. Indoor cleaning is done manually with squeegees, efficient and safe windows cleaning solution.So, you can get a perfect window and gutter cleaning, or only windows cleaning by booking the reliable and high-quality cleaning services of the company. Just call 020 3746 4287 or send an online booking request, and our customer care service will be back to you as soon as possible. You will receive written verification for the booking. There is no deposit necessary, and you will pay only after the service has been completed. The costs options accepted are flexible. No hidden charges, and big deals for returning customers or for those purchasing more than one service at a time.